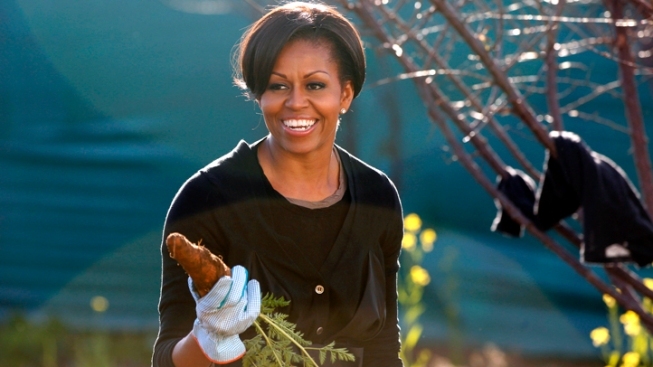 The first lady said she never had a garden of her own when she was growing up on Chicago’s South Side. She said she was inspired to grow a garden on the South Lawn of the White House because she was concerned about her daughters’ diets. "If you could grow a garden, it would be pretty visible and maybe that would be the way that we could begin a conversation about childhood health, and we could actually get kids from the community to help us plant and help us harvest and see how their habits changed,” she said. Obama said she doesn’t think of herself as a “classic” first lady, having never seen a first lady hula hoop or do the Dougie. She also broke ground with the first vegetable garden at the White House since Eleanor Roosevelt’s victory garden in the 1940s. On the show, Obama also addressed rumors that she might go the way of former first lady and Secretary of State Hillary Clinton. “I have no interest in politics, never have, never will," she said. Instead of pursuing politics, Obama said she is sticking to her own passions. Her book, out today, includes pointers for gardening at home, recipes from White House chefs, and pictures and stories about her efforts to promote fresher foods and healthier diets — especially for children. And as for critics who say that the government shouldn’t have a place in people’s stomachs, Obama agrees.